This little hamster lives in the tree house, so he receives food not that often. 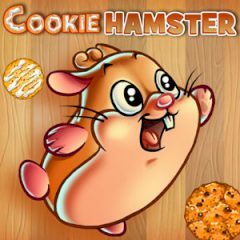 Help him to get the cookie and collect all stars on the road to his main goal. Move beams and push the hamster with them. Some hamsters can't live without assistance, even when they receive food from their masters. The hamster, that lives in a tree house receives food every day, but he can't come and take. Activate beams, that are fixed with dots and deliver the hamster to the cookie. Collect stars during your adventure and increase the amount of points.